There are many projects in progress, in difference stages of completion, which are being carried out concurrently throughout Precinct Two. I want to share the progress with my constituents so they can also see for themselves and feel the great satisfaction of the projects which are currently underway. 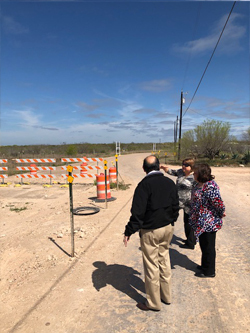 The Colonias on HWY 359 will now have paved streets and all residents will have running water and sewer. One new project that I am happy to announce is the very much needed and long awaited School Bus Shelters on HWY 59 and HWY 359. Another project that is almost completed is the New Quad-City area Fire Station and the expansion of the Justice of the Peace Office/ Sheriff’s Sub-station in Oilton, Texas. Additionally, the residents of Bruni, Texas will have the very first park in the history of the township. These are the few examples of what I have been working on to improve the quality of life of all residents throughout Precinct Two. In this link I will be keeping you posted on the various projects that are in progress throughout Precinct 2.